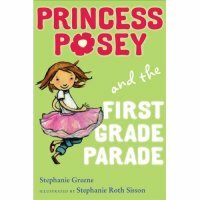 Before we get to our Simple Saturday activity, I want to chat up this first book on the Princess Posey series. It is cute, cute, CUTE!!!! So cute I just had to buy a copy for my great niece. This book is PERFECT for a child who is about to take those big-big-big steps into the scary halls of First Grade! Believe me. Y'all, I just have to brag on my pal, Steph. She's such a great writer that girl has gone and got herself a great starred review in The Horn Book. For real! Dude, that's no literary chump change...I'm telling ya! The activity we're borrowing today comes from the guide written for the second book in this series called Princess Posey and the Perfect Present. The only real bummer here is that we can't buy this book until March! Darn it all. Here. Click on this link and download the Lucky Ladybug Bingo Game and then I'll tell you how to play. Prepare game board by printing pages on cardstock or copier paper. Cut out the nine Ladybug Bingo game pieces. Cut out the nine word labels. Conceal the words on the labels by folding the paper strips in half. Place folded strips in a small box or basket. To play the game remove a folded strip from box or basket. Encourage your wee one to read the word printed on the strip. On the game board, find the picture of the object written on the folded strip. Cover the picture with a ladybug game piece. When all of the pictures have been covered by ladybug game pieces, remove them and begin again! If you'd like to, go ahead and print out a few game boards and play with your friends. The more the merrier! Let's fly away home and have a little lucky ladybug fun, shall we? Speaking of flying home, I'm on my way, John. I've missed you so!